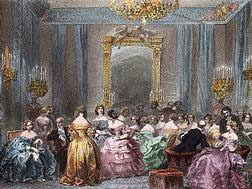 The Ballroom was one of the grandest rooms in a Southern plantation or a Northern brownstone. With ceilings that were nearly 20 feet in height, chandeliers that hung from the massive ceilings light the wooden polished dance floor. Balls began around 9 or 10pm at night and carried on until 2 or 3am in the morning. Guests waltzed, reeled, marched, polkaed, and quadrilled into the night to live muscians. When it was especially hot in the evenings (Deep South), dances were sometimes held out on the Veranda instead of in the Ballroom to enjoy the cool night air. Never forget that ladies are to be first cared for, to have the best seats, the places of distinction and are entitled in all cases to your courteous protection. Gentlemen who do not dance should not accept an invitation to a ball; every gentleman at a ball is expected to dance. The customary honours of a bow and a curtsey should be given at the commencement and conclusion of each dance. In inviting a lady to dance with you, the words, "Will you honor me with your hand for a quadrille?" or, "Shall I have the honor of dancing this set with you?" are more used now than "Shall I have the pleasure?' or, "Will you give me the pleasure of dancing with you?" 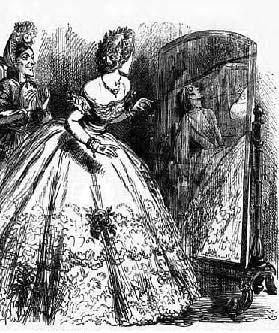 It is best to carry two pairs of gloves, as in contact with dark dresses, or in handling refreshments, you may soil a pair and thus will be under the necessity of offering your hand covered in a soiled glove to some partner. You can slip unperceived from the room, change to a fresh pair and then avoid that mortification. Never remain in a ball room until all of the company have left, or even until the last set. It is ill-bred and looks as if you are unaccustomed to such pleasures and so desirous to prolong each one. Leave while there are two or three sets to be danced. 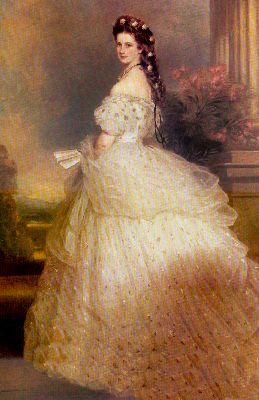 It is not necessary to thank the hostess for the invitation upon departure from the ball, it will break up the party. Instead, a "thank-you visit" is to be paid to the hostess in the week following the ball. 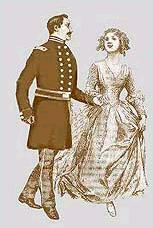 In the Civil War Era, young men and women were not supposed to openly flirt with each other in public. It was considered vulgar and rude, as well as innappropriate. So, to overcome this social barrier, young women developed a coded language to communicate with young men across the massive dance floors at balls. This was the language of the fan. Every woman carried one, not only to accent her dress and cool herself in the hot ballroom, but to communicate without speaking. Of course, everyone else also knew the language of the fan and could tell what a lady was saying to a gentlemen by her fan movements. THE FAN PLACED NEAR THE HEART: "You have won my love." HALF-OPENED FAN PRESSED TO THE LIPS: "You may kiss me." HANDS CLASPED TOGETHER HOLDING AN OPEN FAN: "Forgive me." COVERING THE LEFT EAR WITH AN OPEN FAN: "Do not betray our secret." HIDING THE EYES BEHIND AN OPEN FAN: "I love you." SHUTTING A FULLY OPENED FAN SLOWLY: "I promise to marry you." DRAWING THE FAN ACCROSS THE EYES: "I am sorry." TOUCHING THE FINGER TO THE TIP OF THE FAN: "I wish to speak with you." LETTING THE FAN REST ON THE RIGHT CHEEK: "Yes." LETTING THE FAN REST ON THE LEFT CHEEK: "No." OPENING AND CLOSING THE FAN SEVERAL TIMES: "You are cruel"
DROPPING THE FAN: "We will be friends." FANNING SLOWLY: "I am married." FANNING QUICKLY: "I am engaged." PUTTING THE FAN HANDLE TO THE LIPS: "Kiss me." OPENING A FAN WIDE: "Wait for me." PLACING THE FAN BEHIND THE HEAD: "Do not forget me"
PLACING THE FAN BEHIND THE HEAD WITH FINGER EXTENDED: "Goodbye." FAN IN RIGHT HAND IN FRONT OF FACE: "Follow me." FAN IN LEFT HAND IN FRONT OF FACE: "I am desirous of your acquaintance." FAN HELD OVER LEFT EAR: "I wish to get rid of you." DRAWING THE FAN ACCROSS THE FOREHEAD: "You have changed." TWIRLING THE FAN IN THE LEFT HAND: "We are being watched." TWIRLING THE FAN IN THE RIGHT HAND: "I love another." CARRYING THE OPEN FAN IN THE RIGHT HAND: "You are too willing." CARRYING THE OPEN FAN IN THE LEFT HAND: "Come and talk to me." DRAWING THE FAN THROUGH THE HAND: "I hate you!" DRAWING THE FAN ADROSS THE CHEEK: "I love you!" PRESENTING THE FAN SHUT: "Do you love me?"